Now that Gutenberg has morphed into the WordPress Block Editor as of WordPress 5.0, many people are excited to start building content with this new tool. In fact, there are already a lot of solutions available to expand the new editor’s capabilities. Let’s check out ten of the best block plugins for WordPress! Most of the best block plugins for WordPress are turning out to be collections of elements, rather than single-block additions. Atomic Blocks is a perfect example of this trend in action. This plugin adds 11 new blocks that offer functionality currently missing from the WordPress editor. Best for: This is an excellent plugin for bloggers, providing plenty of features you’ll find handy (such as author profile boxes and post grids). There’s also an Atomic Blocks theme you can try out, which offers styles designed to take full advantage of the new blocks. If you’re looking for a comprehensive package, Stackable is one of the best block plugins for WordPress. It includes 22 new blocks, ranging from simple elements to complex features (such as headers and testimonials). In addition, all of this plugin’s blocks are designed to be fully responsive. Best for: This plugin is a strong all-purpose tool, providing functionality that’s useful for bloggers, e-commerce site owners, and small businesses. You can also pick up the Stackable theme, which is created to work seamlessly with both the Block Editor and this plugin’s added features. Next up, Otter Blocks is our very own take on a WordPress blocks plugin. It’s a lightweight addition to your site, with minimal impact on performance. At the same time, it provides 12 new blocks for you to play with and customize to your heart’s content. Best for: Otter Blocks is another strong pick for bloggers, as well as for business owners in need of features such as pricing and service modules. However, it also offers general-purpose blocks to help you build better headings and pages on any type of site. Advanced Gutenberg is another large collection, featuring 16 new blocks. However, it’s also one of the best block plugins for WordPress because it improves the way the Block Editor functions. For example, it lets you filter available blocks based on user role, and includes new customization options for some of the existing WordPress blocks. Best for: If you’re looking to push the boundaries of content design, this plugin can be a very useful tool. It provides advanced versions of several of the more fundamental WordPress blocks, offering you additional configuration and styling options. Plus, it adds new settings to some of the Block Editor’s existing functionality. The WordPress Block Editor can do a lot of things, but it’s a bit limited when it comes to designing layouts. This is especially true when it’s compared to popular page builders. This is why Kadence Blocks offers a few key elements to let you expand your options for building dynamic, flexible pages. Best for: While the number of blocks on offer in this plugin is small, they’re general-purpose enough to be useful for just about any website. If you’re looking to create pages with complex layouts – and want a lot of control over columns, rows, spacing, and more – Kadence Blocks is worth a look. Unlike all of the previous selections on this list, Block Gallery has a very specific purpose. It includes three new blocks, each focused on helping you design better WordPress galleries. It also offers a drag-and-drop builder tool within the blocks themselves, making it a breeze to add images to your galleries and customize them. Best for: Without a doubt, this is one of the best block plugins for WordPress if you’re a photographer or artist – or you otherwise need to showcase a lot of high-quality imagery. While few in number, the blocks provided greatly expand WordPress’ capabilities when it comes to building photo galleries. Orbit Fox is another of our own plugins, and has a number of strings to its bow. First and foremost, it adds 13 new blocks to your site, providing you with all sorts of new features and customization options. What’s more, this plugin bundles a variety of other features – including an integrated Content Delivery Network (CDN), Google Analytics integration, and a social sharing module. Best for: Orbit Fox is a handy all-in-one tool. It’s useful if you’re looking for some new blocks, along with additional functionality to help you run your site more effectively and enhance its performance. This one solution does the job of several plugins – saving you from having to add a lot of extra tools to your site. There are also plenty of excellent free themes that work seamlessly with Orbit Fox. Ultimate Addons for Gutenberg does a pretty good job of living up to the name. This plugin bundles together 17 new blocks, ranging from layout options to specific advanced features. It covers a lot of the same bases as other blocks plugins, but also includes some more unusual elements (such as the info box and content timeline blocks). Best for: Small businesses should find this particular plugin useful, as it includes plenty of features that are invaluable for company sites (testimonials, team member profiles, etc). There’s also a block specifically designed for restaurants, which is a handy option if you’re in the food industry. Despite the name, Premium Blocks for Gutenberg is another completely free tool. It offers 11 blocks, all of which were built to have a minimal impact on website performance. You can even disable blocks you don’t intend to use, in order to reduce the plugin’s impact further. Best for: Premium Blocks for Gutenberg is a solid well-rounded solution, offering essentials such as accordion tabs, icons, and pricing sections. 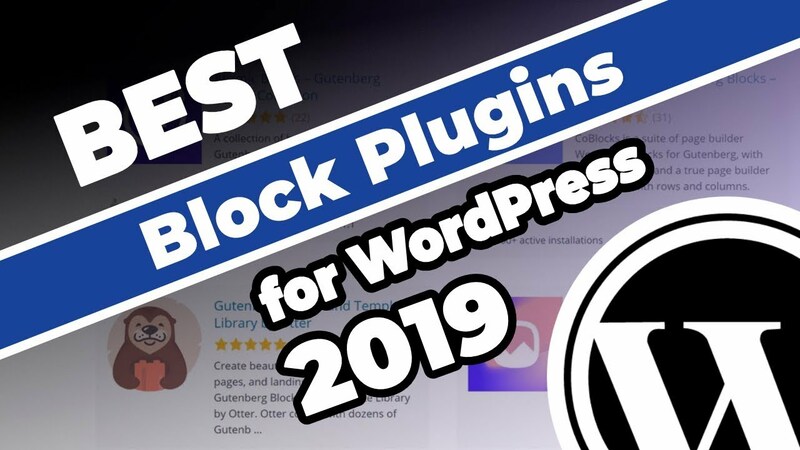 It’s one of the best block plugins for WordPress if you’re looking for a tool to give you access to a few additional features, while staying lightweight and avoiding unnecessary ‘frills’. This last plugin is a little different, as it’s only for WooCommerce stores. However, WooCommerce Product Blocks is worth making note of, as it smoothly combines WooCommerce’s product functionality with the new Block Editor. Best for: If you’re running a WooCommerce store, this is one blocks plugin you’ll want to consider. It enables you to display hand-picked products, items from specific categories or related to particular terms, best sellers or top-rated products, and more. No matter which of the best block plugins for WordPress you choose, it’s super easy to get started with your new blocks. Or, if you don’t see a section, you can search for blocks by name. The WordPress Block Editor can do quite a bit on its own. However, its block-based system offers endless possibilities for expansion and creativity. Each of the best block plugins for WordPress featured above can help you create more original, dynamic content for your website.